The freezer has long since become a necessity for every home, allowing you to store various types of frozen food indefinitely. Nexus is your leading choice if you’re looking to buy high-quality freezers at a price that won’t break your budget. We built our reputation on setting and maintaining the highest standards so you can rest assured that our products are designed for superior performance, functionality and style. Contact us to find the best deep freezer to buy in Nigeria. Incorporating the latest technology, each model is designed to store more and keep your food fresh for longer. Now you can enjoy the comfort of home and make less trips to the store for groceries. We have a diverse selection that will ensure you find the perfect balance between quality and affordability. With our quality range of chest freezers, not only will you no longer have to lose sleep over your food going off, but your chest freezer will be a stylish addition that complements the aesthetics of your kitchen. Despite the impressive storage space in our chest freezers, they are energy efficient and capable of holding the ideal temperature, keeping your goods frozen and fresh. Contact us to find out more about our exciting range of chest freezers. When you buy a freezer with us, our service goes beyond the sale. We understand that a freezer is an investment, which is why our team will support you with hints and tips to get the best out of yours. We aren’t just dedicated to offering you affordable freezer prices; we are committed to ensuring you get the most out of your home appliances. Deep freezers are an innovation that can be used for both residential and commercial use. 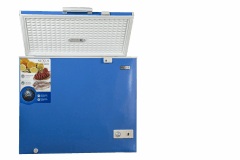 If food preservation is your primary concern, then selecting the best deep freezer for your requirements is paramount. There are two types of deep freezers which are distinguished primarily by energy consumption and the space they take up. Chest freezers are usually rectangular-shaped, although there are a host of compact models that are cube-shaped. Chest freezers can hold different sizes and shapes of packaged food and are often regarded as the most economical type of freezer. The built-in side wall insulation gives these freezers their impressive capacity to hold their temperatures. During a power outage, they can keep food frozen for up to three days, provided the lid is closed. Upright freezers look almost exactly like normal fridges with the only real distinction being that they have one door. An upright freezer consists of stationary shelves and compartments inside the doors that can hold small items. There is also a series of interior shelves. The attraction to this type of freezer is ease of access and the ability to efficiently sort and organise your food. Why you need a Nexus freezer? Recognising that any home appliance purchase is an investment, we make sure to design and manufacture durable freezers that will stand the test of time. They are engineered to maintain optimum performance throughout their use. Not only are our freezer prices affordable; they are also fairly priced to suit your budget. Each model sold has undergone the necessary testing and quality assurance to guarantee peak performance and functionality. Part and parcel of effective food preservation is capacity. Each Nexus model is designed to offer an optimal amount of storage space, allowing you to store more and shop less. Contact us today for affordable freezer prices and food preservation solutions.